OK�I think I got it now�Damn computers.� �It wouldn�t let me do what I wanted to do.�� Thanks to all those who pointed out that the photo was not attached to the previous message.� Oh well. Here is version 2! My New Years Resolution is to do a better job in keeping in touch with you. Some of you may remember when Paula and I started out on this adventure in 2003 (full-time RV living), that I sent a few "newsletters" about what we had been doing. Unfortunately, or fortunately, you might say, I did not keep up with the project. This year I resolve to do better. But I'm not going to send you travel logs of the places we've visited. Instead, I'm going to send you a photograph depicting some site that we've seen. I won't send you giant photos that will fill up your mailbox, but small ones that will not take up much space. Anybody who wants to "opt-out" can do so at any time without affecting our friendship. Just reply and tell me that you are cutting down on your e-mail so that you can spend more time with your family, and I will take you off the distribution list. We've been in Tallahassee, Florida, for the past few months. St. Marks National Wildlife Refuge is 30 or so miles south of Tallahassee. 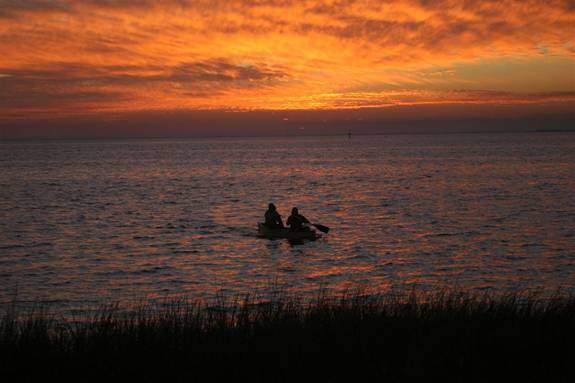 I thought this shot of a couple of local fisherman paddling their canoe away from the sunset would be appropriate for today. We are all moving away from the sunset of 2006, toward the hopefully brighter dawn of 2007.